Mountain bikes come in many shapes, sizes, and capabilities. They also come at many different price points. If you’re the type of person who’s looking for something a little more budget friendly, or you are just starting out, you are going to want to find a good mountain bike that comes in at a budget price. You don’t always have to suffer a poor quality two-wheeled machine just because you’re spending less. There are some great mountain bikes that won’t empty your bank account. There are also plenty that won’t live up to the task. It is important to know what you are looking for and make the right decision before you buy. We have done the research and put together a list of the 8 best budget mountain bikes in 2019. With the information you’re about to peruse, you should be able to make a confident buying decision. Got a budget in mind? Check out these mountain bikes under $300. This Schwinn dual suspension bike is going to be great on the rough trails. It is designed to be ridden by beginners and experienced riders alike. The aluminum frame is nice and lightweight. You can easily take it over your favorite jumps and maneuver the bike smoothly around tight corners. The 26″ alloy rims hold on tightly to the knobby tires that will give you the grip you need. You can easily climb hills and pick up speed on slight descents with the 24-speed derailleur which is controlled easily by EZ-fire shifters. You won’t have any trouble coming to a full stop with the rear V-alloy brake and the front disc brakes. The dual-suspension is going to keep you comfortable on a ride of any ferocity. This is a really durable and reliable bike for any mountain enthusiast. Why we like it – As far as a well priced and reliable mountain bike goes, this one does the trick and is a ton of fun to ride. You get everything you need to hug the corners tightly and go over the ramps with finesse and precision. 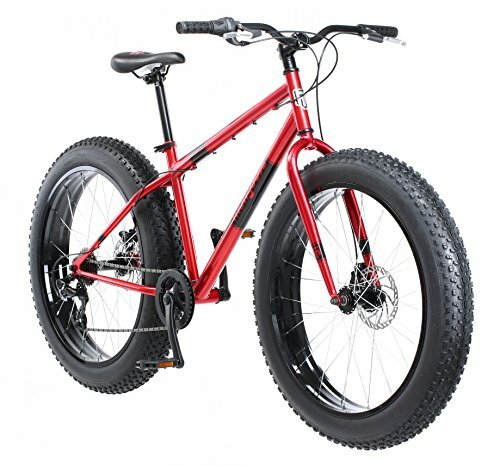 For the times you need to be able to go over pretty much any terrain imaginable, you want some fat tires. The Mongoose Dolomite comes with 4″ tires and can conquer terrains such as dirt, rocks, snow, sleet, and rain with ease and comfort. There are few types of tires that will be more comfortable and easy to ride than the 4″ tires. Along with the fat tires, you will be strong and sturdy on a reliable steel frame. This bike is not light and is meant to be ridden on the rugged and tough terrain. the Shimano 7-speed derailleur will allow you to climb hills easily. And, since you already have a lot of weight to deal with, the alloy rims will help keep as much weight off as possible. For anyone who is in the mood for a beefy, comfortable ride, the Mongoose Dolomite is the way to go. Why we like it – There is something special about riding a bike with fat tires on it. You feel like you can accomplish anything and that nothing can stand in your way. This isn’t the quickest bike on pavement or smooth trails, but on the rougher terrain, there are no complaints to be had. Merax was founded in 1995 and have been delivering quality products to the market ever since. With the Falcon Full Suspension mountain bike, you get a really nice and smooth ride at a really great price. 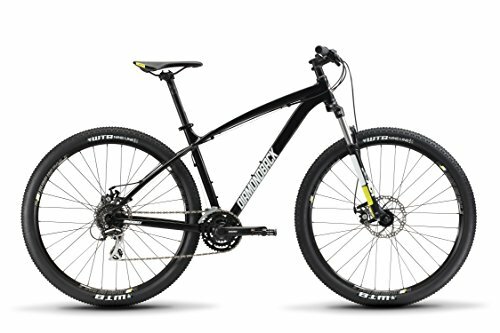 Compared to other budget mountain bikes, you will not have to deal with the jutting bounces of unnoticed bumps on the trail. The suspension allows you to glide over rocks, jumps, grass, and everything else with a suave smoothness. Linear pull brakes give you the stopping power you need. The 21-speed derailleurs will give you seamless shifting between your gears. This bike has been designed to tick all the boxes of an entry level mountain bike. With the choice of different designs when the bike is purchased, you can customize it to the look of your desires. Why we like it – Not needing to worry about having the bike jolt you off as you glide down the mountain gives this bike the comfort you want in a budget mountain bike. It’s a lot of fun to ride and it will be reliable and last for years to come. Schwinn has been around for a very long time. They are the guys that know what they are doing when building bikes. They have done a great job with the Traxion mountain bike. While saving you money, they have designed a bike that hugs corners, blasts up hills and stops on a dime. The bumps are totally soaked up with the dual suspension. You have a forgiving back-suspension spring and a really comfortable front suspension fork. You can glide over almost any terrain and not be budged. The 24-speeds, changeable by EZ-fire shifters make it easy to change gears. Mechanical disc-brakes on the front and the back make stopping a breeze on any terrain and during any conditions. The rims are double walled and made of alloy. They are incredibly strong and house the knobby tires perfectly to keep you on the trail. Schwinn creates exceptionally durable alloy cranks on the rims which will equate to less maintenance on your end. Why we like it – Schwinn Traxion is unrivaled when it comes to the traction it supplies on the trail. 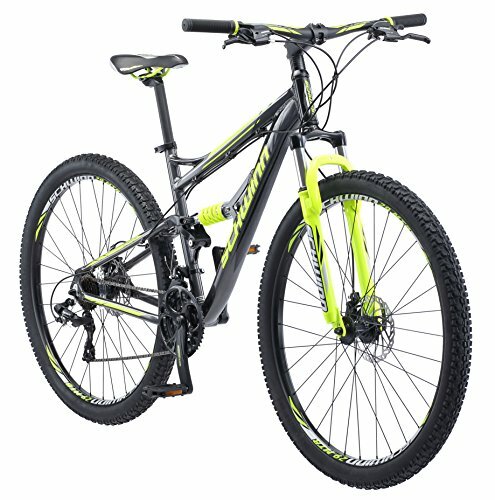 This bike is great for any mountain biker looking for a cheap bike of the ‘trail’ variety. You will have just as much fun on this bike as you would on bikes of a slightly higher price bracket. Hardtail bikes are what give you the real feel of the trail. They have an authentic and old school feel to them. Hardtail mountain bikes are great for more forgiving and easy riding trails including grass, dirt, and roads. The Diamondback Overdrive 29 Hardtail Mountain Bike comes with impressive strength and durability on the trail. You get your comfort and control with the front suspension fork. You don’t have the extra weight and inconvenience of unneeded speeds on the bike. This one comes with an 8-speed derailleur which will be sufficient to get you up the hills. They have provided riders with great stopping power in any condition. Tektra disc brakes on the front and back offer some amazing stopping control. This budget mountain bike is handmade and comes mostly assembled for you to get on the trail faster and with less home assembly. You can decide what size of bike you need as they are able to provide numerous sizes for different sized riders. Why we like it – This is a mountain bike that feels super sturdy. When you get on the seat and start pedaling, you know that this bike means business. Without any of the extra bells and whistles, you will fall in love with this bike and you will want to be riding it more often than just the weekend. There is a good reason why we feature so many Schwinn bikes on our list. They are simply one of the most reliable bikes manufactures in business today. They continue their legacy with the Protocol 2.7. The dual frame suspension and the front suspension fork allow you to conquer the trail with ease and comfort. They love to give you the extra speeds, and they do so again with the 21-speed derailleurs to get you up and down in record time. Ez-fire triggers made by Shimano also allow you to fire through the gears as fast as you can possibly imagine. Stopping will be no problem with front and rear mechanical disc brakes. Simply the best style of brakes for mountain bike riding. You will be able to stick tightly to the corners and not worry about the destruction of your tires. The rims are double walled alloy and hold on tightly to the knobby tires. Again, they provide durable alloy cranks to keep down the maintenance time. Why we like it – This budget mountain bike is like the big brother of the Protocol 1.0. 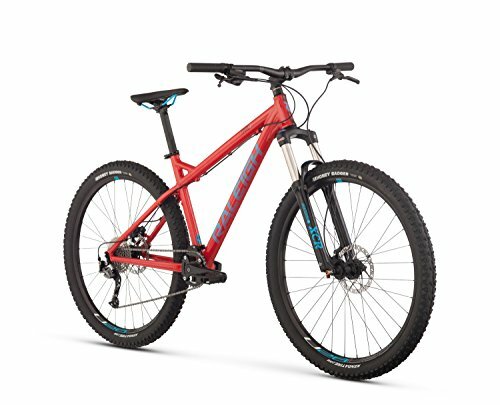 They made a fantastic mountain bike and decided that it could still use a little improvement. This version is just a bigger, stronger, and tighter bike that you will love time after time. 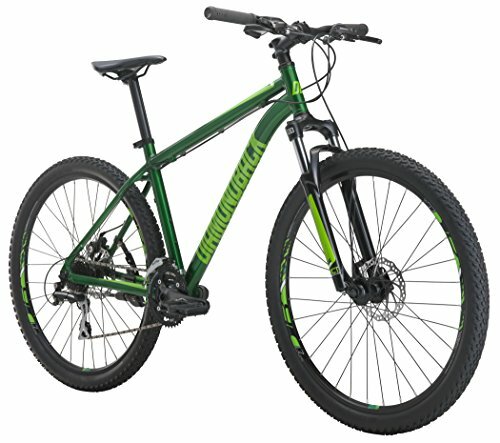 Great for any new mountain biker, or someone who is looking for a cheaper backup ride. Diamondback Bicycles understands that you don’t always want to reach way down into your pockets in order to have a good ride down the mountain. This aluminum hardtail bike gives you everything you need to get out of the city and onto the trails. 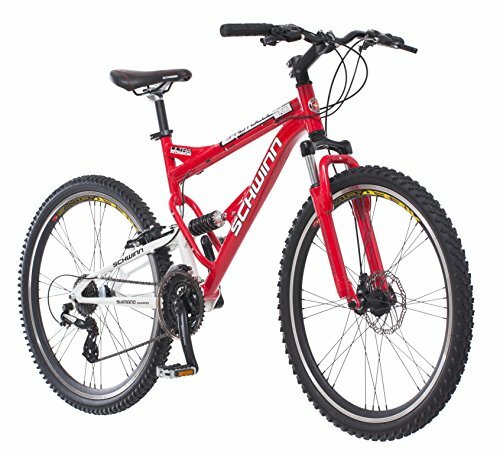 You will have a highly responsive ride and feel every part of the trail with this bike. 27″ wheels will allow you to roll over the terrain comfortably. 24-speeds will give you the versatility to climb, soar, and glide along all of your favorite trails. A large 4-inch suspension fork will allow you to have a little extra comfort on those bumpier days. On the big knobby tires, you will have the peace of mind that mechanical disc brakes provide. This bike is designed to keep you hugging the trail at all times without any discomfort. Why we like it – This bike is designed to make you have as much fun as possible on the trail. You can feel everything you need to and become part of the trail. It comes equipped with everything you need and want, and also saves you money at the same time. Raleigh wants to give riders the chance to build up their chops before sinking into a less budget-friendly mountain bike. They have done just that with the Tokul 2. The frame has a little bit of a relaxed geometry which makes for a very comfortable and forgiving ride. They have not overdone it when it comes to the design of this bike and it sits exactly where you want it to. The 27.5″ wheels allow you to glide easily over all mountain and road terrains. Without the rear suspension on the hardtail design, you gain stability and responsiveness to keep you on the trail. The frame is made of aluminum and only weighs 30 pounds. 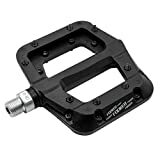 That will give you the finesse and control you need to be able to navigate the trails with ease. Hydraulic disc brakes will let you stop on a dime, and the SR Suntour front suspension fork is what’s going to give you that added level of comfort. 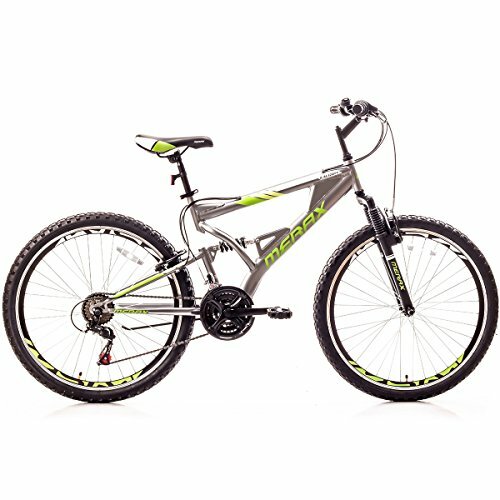 A great bike for any beginner looking t get the feel of the off-road trails. Why we like it – You don’t always have to start off with the best products on the market. This bike is designed for beginners and allows bikers to navigate their favorite trails easily and comfortable without emptying their bank account. Any new rider would be happy to have a bike like this to learn on. You won’t always have the best information coming from bike salesmen and manufactures. You are going to need to know what to look out for when you are buying your first mountain bike. Budget bikes are not like others. Most of them have been made using parts that are a little less superior to those of their more expensive counterparts. However, you still want to ensure you are getting the best bang for your buck. We have put together a short buyers guide of things you should keep an eye out for when buying a budget mountain bike in 2019. The times are changing quickly, and the bikes we have today are not like the ones available decades ago. When you’re buying your first bike, you want to keep it simple. Look for a bike that is the right size for you, and is not going to be too long or too short. Luckily, manufacturers provide sizing charts which make it easy to figure out which size is right for you. Having dual suspension can be a great thing. Are you going to be riding on mostly smooth trails with very few rocks or large obstacles in your way? If so, you can afford to stick with a hardtail bike that doesn’t come with dual suspension. If the trails near your house are more rugged and rigorous, a dual suspension bike can really come in handy and give you that extra leeway you need. If you don’t have enough suspension or give in your riding, it will be harder on your arms and legs and will make riding a lot less fun. The weight of the bike will make a big difference in a few different ways. First off, a lighter bike will be easier to store and move around for the times when your trail is too far away to ride to. A lighter frame will allow you to have more control over the bike. You will be able to stop quicker, turn tighter, and have dominion over where you are going. Sometimes heavier bikes can be better. But in the case of beginner mountain bikes, you are going to want something a little bit lighter. Aluminum frames are designed to be more lightweight than steel or other forms of metal. An aluminum frame should be what you look for in a budget mountain bike. Especially if you’re just starting out. The type of brakes on your bike are what are ultimately going to keep you safe and away from that tree that you’re speeding towards. Disc brakes are the most reliable brakes on the market and are being used by all the top riders. They work better, last longer and don’t break as easily. You’re going to want to make sure you’re staying as safe as possible on the trail, and, hydraulic or mechanical disc brakes are going to be the piece of the puzzle that helps you do that. Tires are your point of contact with the ground. To ensure that they stay that way and the point of contact doesn’t become your face, you want to make sure you’re getting the tires that will be right for you. Knobby, thicker tires will allow you to have more grip and comfort when you are riding. If the tires lack the ability to dig into the dirt, you may find yourself sliding all over the place and out of control. Keep it tight and on the right terrain by getting tires that will keep you safe time after time. Sometimes, the best way to tell if something is going to work for you is to see what other people have to say about it. If you are looking for a bike that has a ton of terrible reviews, or no reviews at all, maybe that’s a bike that you can steer clear of. But if people are saying a lot of great things about a bike, and specifically talking about the type of riding you will be doing, then you can probably be pretty confident that the bike will do the trick for you as well. Most people are there to help and give their honest opinions. If your bike has a lot of positive feedback, you can likely go ahead and pull the trigger as long as it hits on the other points that are important to you. 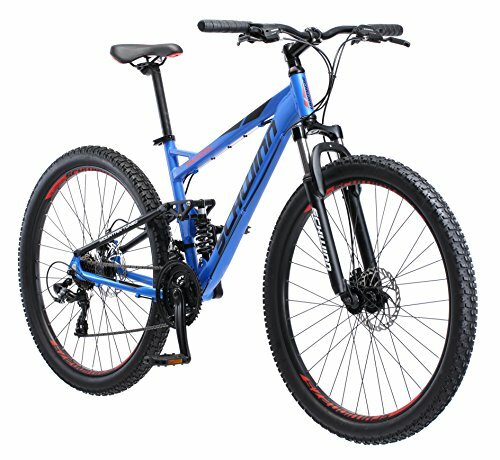 Buying a budget mountain bike should be a fun and easy process. After all, you’ve decided that you’re going to get your adrenaline fix from speeding down a mountain, and not from being angry over buyers remorse. We hope to have provided you with the information you need in order to pick the right budget mountain bike for you. You’re about to embark on a wonderfully exhilarating journey and you will hopefully enjoy every moment.